The venerable classic green two-burner stove was getting a little long in the tooth. My lantern and heater all run on 1 pound propane canisters and it didn’t make sense to lug along liquid fuel just for the camp stove. It was time for an upgrade to a new camp stove for an upcoming elk hunt. 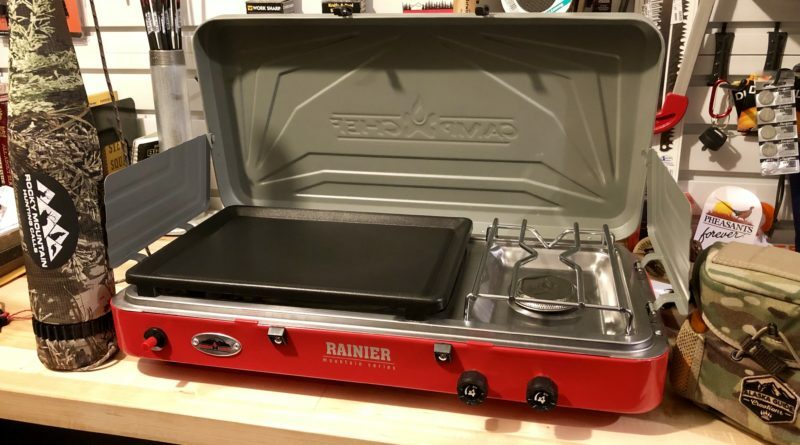 After looking at the available options I zeroed in on the Camp Chef Rainier camp stove. This model nicely suited my group’s needs for our truck camping set up. Here’s a review of the Camp Chef Rainier. I recently upgraded my 12-year-old bow to a new model and the technology had taken a quantum leap forward during that time. Going from my old green liquid fuel pressure stove to the Camp Chef Rainier was a similar experience. Moving to a modern propane stove was a big step forward in both ease of use and features. 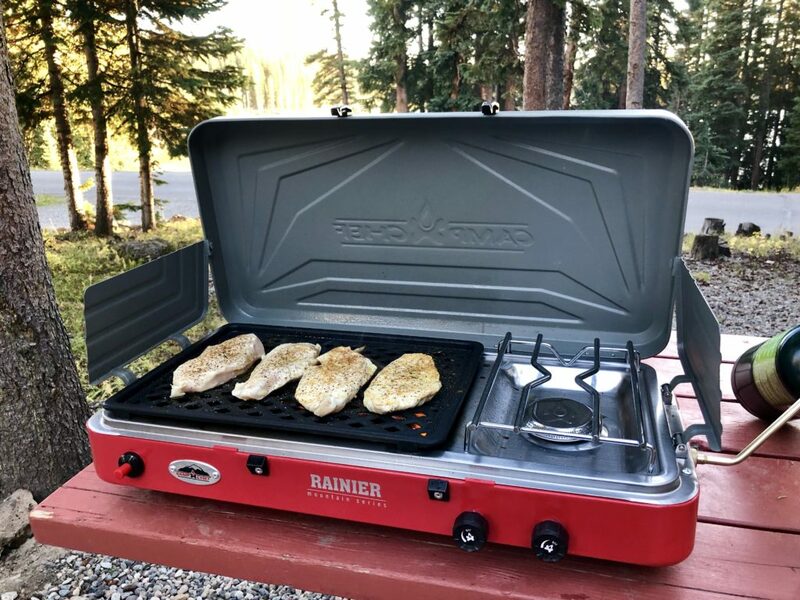 Beyond the ease of propane, the Rainier features a really clever design with an interchangeable griddle and grill surface along with a conventional burner that makes it perfect for camping. On my elk hunt, it was great to come into camp after dark and use the grill surface to prepare a quick meal before hitting the rack. 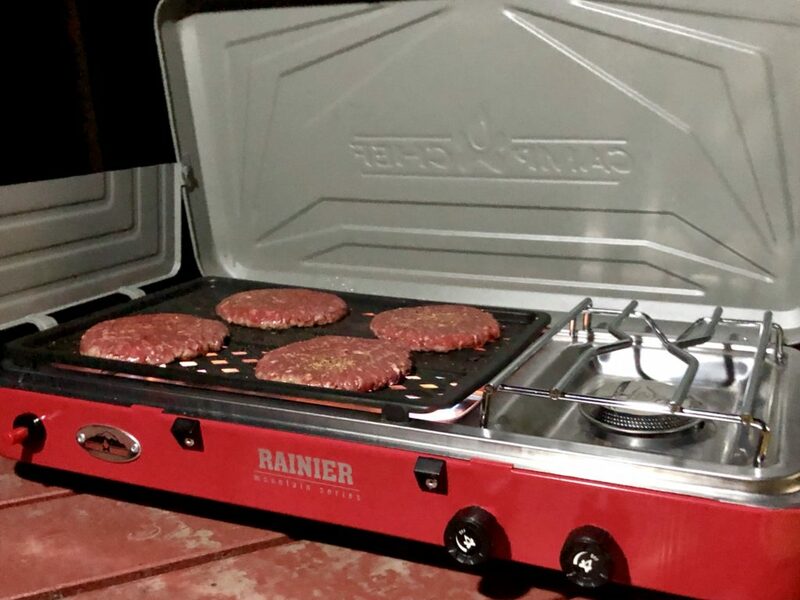 The Rainier has a removable grease tray for use while grilling, however, the area under the grill does get a little messy when grilling. It’s stainless steel, but it does take a little elbow grease to clean when you get home. One of the things that I’ve always liked about my old liquid fuel stove is it’s a classic and iconic design. Camp Chef has done a great job of creating a modern classic. The design and all metal construction give a nod to stove designs of the past, but it has modern features and truly exceptional build quality. 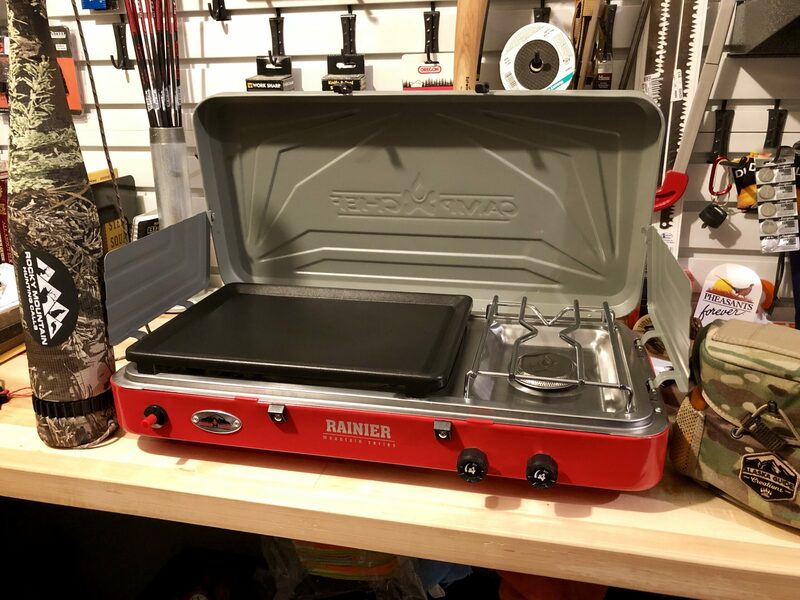 The Rainier can be purchased with just a griddle or as a combo package with a stove, griddle surface, grill surface and carrying case. I think the combo package is the way to go for the added flexibility. Pro Tip: Line the underside of the burner under the grill with tin foil to make for easier clean up. 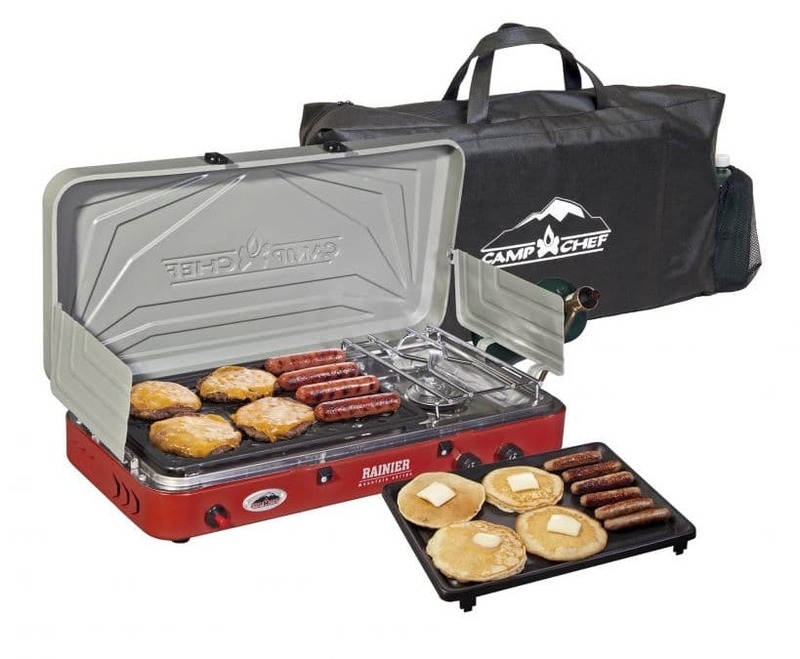 Camp Chef Rainier Campers Combo includes a griddle, grill and carrying case. Image courtesy of Camp Chef. Cooking Dimensions: 12 in. x 23.5 in. Cooking Area: 267 sq. in. If you’re in the market for a new camp stove, I am not aware of a better stove set up for car camping than the Camp Chef Rainier. It sports high-quality construction, flexibility with its multiple cooking surfaces, and at $130 for the combo it’s a great value.